The main table is based on the overall movie. It’s hard to select mission scenes on this table because you have to spell out certain words by going up ramps a bunch of times. And it seems like the ball can go down the hole especially quickly on this table. So I didn’t like this one as much. 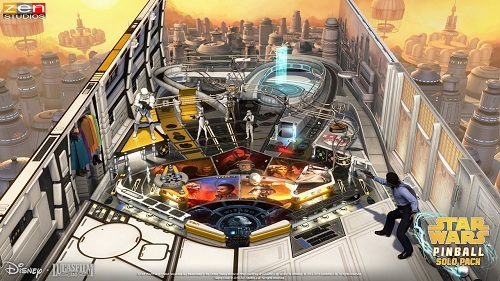 Lando Calrissian gets his own pinball table! I think this is my favorite of the bunch, and no, it’s not because I met the guy who played the original Lando, Billy Dee Williams, at PAX one year (although that is a feather in my game reviewing cap). This table is fun because missions are easy to activate. Just send the ball to the target under the Millennium Falcon three times. What’s cool is that the missions are based on not only Lando’s appearance in the new Solo movie, but also his adventures in comic books, the Star Wars Rebels cartoon, and the other two movies he was in, of course. Zen Studios really did their homework! What you must do in these missions is fun and pretty easy to understand, so yeah, best table of the pack right here. I liked the Cloud City background and when Lando rolls a ball into a smuggling container on the field. So in the Solo movie, there’s a part where Han is working for the Empire and he gets sent to a swamp planet. He gets caught doing something and is punished by being thrown into a pit with a monster, which turns out to be Chewbacca. And that’s how they met! 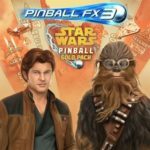 I had to look that up because I didn’t remember that scene in the movie very well (except for the Chewbacca part), and the pinball table doesn’t do much to convey the feel of that part of the movie. This table is different because there are no missions to complete. Instead you have lights on each side of the table that represent the life and energy of the Mimban army and the Imperial forces. You have to shoot up ramps to beef up your offense and defense, and also attack the other side. This table is confusing because of all the random stuff that can happen. Winged monsters can suddenly appear and take your ball to another place for no apparent reason. There is a multilevel part of the table, but it’s small and hard to see. And sometimes the camera shifts to one of those giant walkers, but your ball can still be in play and rolling around the field, which is distracting. So basically what we have here are two OK tables and one good one. It could be better, but at least the Lando table is cool. All Pinball FX3 tables are rated E-10 with ESRB descriptors of Fantasy Violence and Mild Language. Aside from some laser blast exchanges from heroes and stormtroopers, this game is fairly non-violent. It is pinball after all. Kids love Star Wars, too, so they’ll probably enjoy the pick-up-and-play nature of these tables. If you’re OK with them watching the Star Wars movies, they’ll be OK with this game. Reading skill is helpful for some of the rules and menus, but not necessary just to play. Man, Pinball FX3 has so many tables now. It’s hard to choose. I need to get into these. They look like a lot of fun.